However, the good news is that while the product may look imperfect, the cookies will generally still taste delicious. As my friends know, I can be a perfectionist when it comes to baking and any cookies which I deem unacceptable for others to eat or see are classified as the “rejects” and generally do not leave my house – for fear that someone will see them or, god forbid, eat the second rate baking! However, I am also very against wasting food. 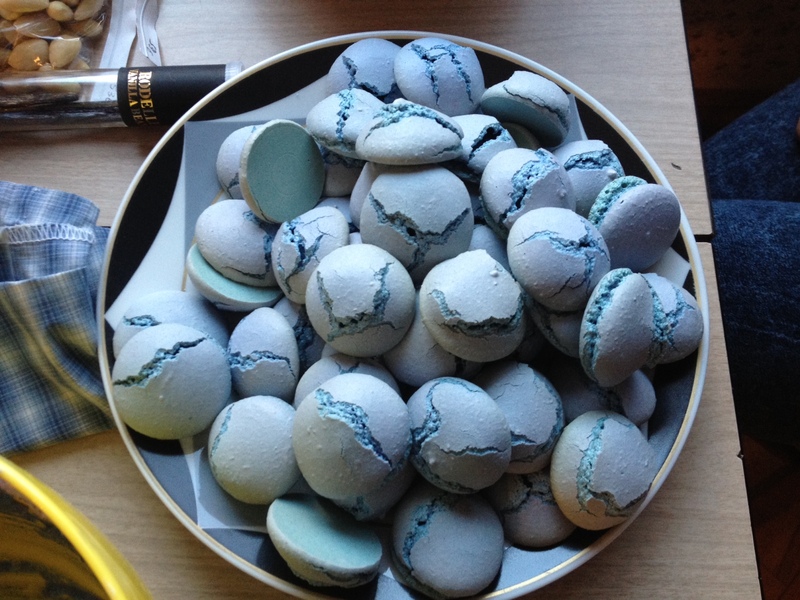 Thus, since it is somewhat impractical for me to eat all of the imperfect macarons which have resulted during my experimentation with past recipes, I have come up with a delicious dessert which can be made with the left over macaron shells. 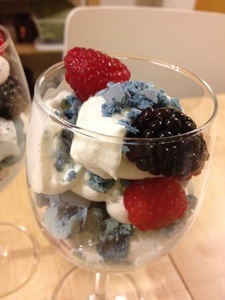 This is a variation of the classic English dessert: Eton Mess. Eton mess is one of my favourites – made with crushed meringue cookies, softy whipped cream and your choice of fruits or berries. 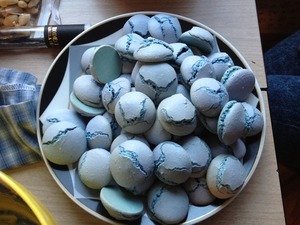 Instead of baking up a batch of meringue cookies specifically for the Eton Mess, I substitute any cracked or otherwise imperfect macaron shells I have left over. I also add just one teaspoon of balsamic vinegar to the fruit. While this may sound a bit strange, it adds a really great flavour to the dessert (I got this idea from my Jamie Oliver cookbook and have never made this dessert without the vinegar since). 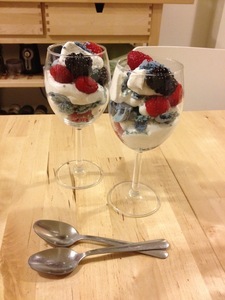 The dessert is light and easy to assemble, making it a great treat to serve at a dinner party! Split the vanilla bean in half lengthwise and use the dull side of a knife to remove seeds. In the bowl of an electric mixer, combine vanilla seeds, whipping cream and sugar. Mix on medium speed until the cream is whipped to a soft stage. Divide mixed fruit into two bowls. Add the balsamic vinegar into one bowl of fruit and use a wooden spoon to mix the fruit and the vinegar. Continue mixing to muddle the fruit - breaking up and pressing with the spoon to release the flavours. To assemble your eton mess, use parfait or wine glasses. Layer your fresh fruit, whipped cream, macarons and muddled fruit. Repeat layers to fill up the glass and serve immediately.